On today's blog we look at commonwealth countries unite against plastic pollution and the United Utilities temporary use ban. Environment Minister Thérèse Coffey hosted a meeting of 30 High Commissioners from Commonwealth countries today in London. 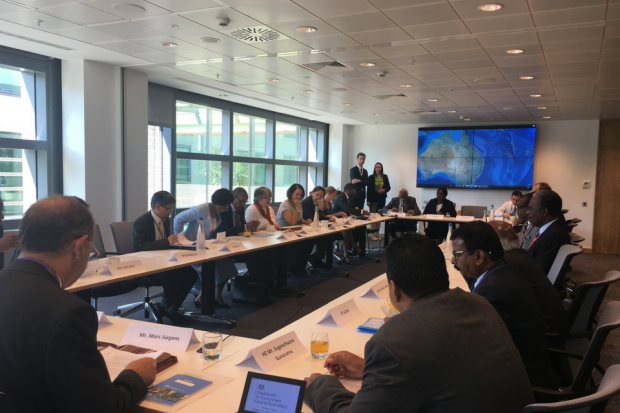 The meeting was the first time that representatives from the Commonwealth Clean Oceans Alliance (CCOA) have met, as four more countries sign up to the UK and Vanuatu-led efforts to tackle ocean plastic. The Alliance, which was announced by the Prime Minister during the Commonwealth Heads of Government Meeting in London (16-18 April), aims to unite countries around the Commonwealth so they can work together to turn the tide on plastic entering the marine environment. Three months on, Australia, Fiji, Kenya and St Lucia have now formally joined the Alliance and will sit alongside New Zealand, Sri Lanka and Ghana to create a nine-strong coalition in the fight against plastic pollution. Minster Coffey also outlined the assistance available from the UK to support Commonwealth countries through the £61.4million Commonwealth Oceans Plastic Package. Marine plastics pollution is one of the greatest environmental challenges facing the world today, requiring a truly global approach to developing a solution. Today United Utilities announced that a hosepipe ban would be needed in the north west from the 5th of August there is no rain before then. The water restrictions will ban the use of hosepipes or sprinklers for watering private gardens and washing private cars affecting around 7 million people in the region. The announcement has been covered widely in national media today, including the Express, Daily Mail, The Times, Daily Mirror, Daily Telegraph, The Guardian, The I, The Sun , Daily Star, BBC Online and ITV Online, and Huffington Post. This follows a very warm and dry start to the summer in a region where water supplies are drawn from reservoirs and rivers. Environment Agency Director of water, land and biodiversity Pete Fox gave interviews to the Today Programme, BBC 5 Live and BBC Victoria Derbyshire. Cumbria’s unique geography makes it sensitive to high and low rainfall and the Environment Agency works with communities throughout the year to manage this. During dry spells it’s not unusual for some rivers and lakes in the North West to deplete quickly, during even short periods of low rainfall, and they tend to recover quickly when the rain returns. Over two very dry months, we have seen a rapid decline in reservoir levels in the North West and we support the announcement by United Utilities to manage water supplies by introducing household restrictions. Across the rest of England, most groundwater supplies are at healthy levels and water companies have enough water to maintain supplies if resources are managed properly. Many rivers around the country have dropped to lower levels than normal for this time of year, which can be damaging to wildlife. We have robust plans in place to respond to these pressures and have stepped up our incident response as well as regulation of those abstracting water to ensure the environment is protected.